When we moved to our current property we fell in love with the surroundings. There were 9 acres complete with the standard old farmhouse with three out-buildings behind it. The old farmhouse was nothing to be proud of but anybody that stopped by always commented on the beauty of the property. The Portage River flows on the east side of our property then bends and outlines the entire south side as well. The entire west side of the property has a creek flowing into the river. During the first spring of living at the new property there was flooding throughout Michigan unlike anything the state had seen in decades. 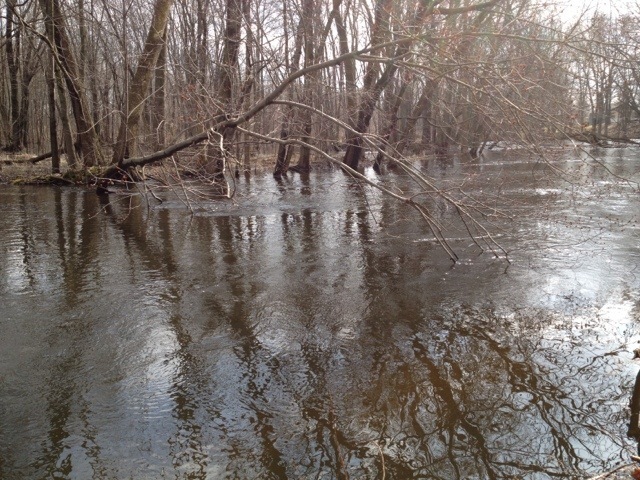 Our river swelled up over its banks and flowed over the entire southeast corner of our property. Our new neighbors said they lived next door for 22 years and have never seen the river that high. On a bright sun-filled day, I decided to get my waders out of storage and introduce myself to the river. The water flowing over the yard was up to my shins and was flowing pretty fast but not enough to disrupt my walking. Even when I stepped off the bank into the actual river there wasn’t a strong enough flow to slow me down. As I slowly progressed into deeper waters the current became stronger and stronger. What was usually a fairly shallow and smooth river had grown into a powerful force. Before I could get all the way to the center of the river I had to stop or the water would have filled my chest-high waders and carried me away. Holding myself up against the current without being swept away was more of a strenuous endeavor than I would have guessed. Pushing myself against the flow was unnatural and consumed large amounts of energy. I mention this story to share what seems to be an obvious point. Going against the flow is unnatural and consumes large amounts of our energy. Going with the flow is simple. Time stands still when you are in the flow. I think of sports stars like Michael Jordan, Lance Armstrong, or Muhammad Ali being in the flow while they’re making their sport look effortless. I think of Stephen King or Nicholas Sparks writing a novel while in the flow. I think of a few of my favorite Scientists like Benjamin Franklin, Charles Darwin, Sigmund Freud, and Steve Jobs piecing together there theories while in the flow. All great discoveries and products in our society today are a direct result of someone being in the flow. Which begs the question: If its so obvious that living in the flow and going with the flow is so natural then why do we resist it? I was fortunate enough to make a discovery this morning while being in the flow with my dear friend, Joanne! I discovered the biggest thing keeping me out of the flow was fear. I knew fear was an obstacle of mine in many areas but for whatever reason I never connected the dots that fear was keeping me out of the flow. No wonder the last two years seemed like such a struggle. No wonder I’ve been beating my head against a wall trying to be somebody I’m not. Where do you find yourself today? Pushing against the flow and spending tons of energy trying to swim upstream? Going against your own Mysterious Flow will always lead to stress, anxiety, and failure. Sure, you might get a promotion or make some monetary gains but at what cost to your own well-being and the loved ones around you? There’s one last piece of the story I need to share about the river; later that week when we canoed downstream, the higher waters helped us avoid most of the obstacles that would have normally been in our way. The flow was greater and stronger, and yet the obstacles were less frequent. Instead of fretting because the river in your life has flooded and is roaring over the riverbanks, take comfort in knowing the flow is moving stronger and faster to assist you to get to where you’re going. Open yourself up to the possibilities of your Mysterious Flow! Previous Welcome to Mysterious Flow! Great story and very reflective when we discover that we are dealing with things we didn’t really realize were evident in our lives. I can’t help but say tho…that the flow of the Holy Spirit in my own life is what brings direction and is the river I follow. If I followed my own flow I’d be in serious trouble. Love you. Hey Becky, Thanks for responding and thanks for reading my blog! Life is definately an interesting journey to say the least! In response to your last comment I wanted to respond but I know its such a tender subject for so many people. My response for you is encouragement though. I want you to know that you have more power, more wisdom, and more creativity than you give yourself credit for! You are an extraordinary woman and your presence is something you can be more sure in. Don’t sell yourself short, you have more intuition and more FLOW than you realize. Who do you think gives it to you in the first place? I believe you are a confident, beautiful, intelligent woman who needs to give herself more credit for the amazing decisions she has made in life. I’m not doubting your flow comes from the Holy Spirit, but I think sometimes we’re unfair to ourselves when we blame all our bad qualities on us and whenever we get something right we say it coulnd’t have been us so it must have been the Holy Spirit. I’m reminded of the quote from The Help where the maid repeated with the little girl, “You is kind! You is smart! You is important!” I’m not trying to take away the power you feel you have from the Holy Spirit, but I do want you to grasp just how powerful you are as an amazing woman! Love you!